“Food is a weapon. 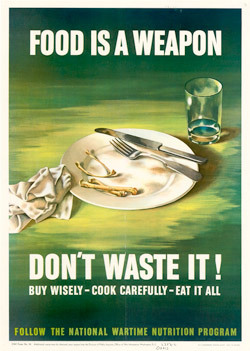 Don’t waste it” was a popular motto during World Wars I and II, when the US made it a national priority to conserve resources by curbing food waste. Today, approximately 40 percent of food (about 20 pounds per person per month) in the US gets wasted, while 17.6 million American households are food insecure. Waste happens all along the food chain from field to plate, and waste in our homes accounts for 28% of fruit and vegetable losses alone. A lot of that waste could be prevented by simple habit changes. The National Resources Defense Council estimates that if we reduced our food waste by 15 percent, we could feed 25 million Americans. Making sure food gets into bellies instead of the landfill also ensures that precious water, labor, and money aren’t squandered. With help from NRDC, we’ve provided some easy tips you can use to take a bite out of food waste and save time and money in the process. Ugly produce needs love, too. Due to cosmetic standards, most oddly shaped fruits and vegetables rarely make it to the grocery store shelf, but at the farmers market, you can find less-than-perfect-looking but perfectly delicious specimens. Help boost the demand for produce that would otherwise go to waste, while giving these unsung heroes a good home. Love your leftovers. Eat them as-is, or give them a fresh twist by tossing them in salad, into a taco, or scrambling them with eggs. Some foods, like soups and curries, are even better on day two. In An Everlasting Meal: Cooking with Economy and Grace Tamar Adler writes, “Great meals rarely start at points that all look like beginnings. They usually pick up where something else leaves off.” Use those chicken bones or vegetable scraps to make stock, toast stale bread with some herbs for croutons, or combine that little bit of yesterday’s stew with some rice and top with an egg for a hearty lunch. Find ideas and recipes for using up leftover produce before it goes bad. Unleash your inner artist. Let food waste inspire your culinary creativity. Turn watermelon rinds into pickles, overripe avocados into chocolate mousse, or carrot tops into pesto. Eat in order of operations. Eat food in the order of purchase. First in the fridge, first out (FIFO)! When dining out, order wisely and take any leftovers home. Every couple days, take an inventory of your fridge to make sure items don’t get forgetten. See what you have on hand before shopping or eating out. The freezer is your friend. When you can’t eat it all, store excess food in the freezer to extend its edible lifespan. To retain nutrition and color, blanch vegetables by immersing them in boiling water for several minutes and then plunging them in ice-cold water before freezing. Pack in an airtight bag to avoid freezer burn. Find tips for freezing and other preservation methods at the National Center for Home Food Preservation. Veggie tops are tops. Don’t toss those beet greens, cauliflower leaves, lemon skins, or broccoli stalks. Many fruit or vegetable parts typically assumed to be trash are not only edible but also nutritious and delicious. Carrot tops can be used in place of parsley, while fava pods can be grilled and eaten along with the beans. Find more tips in Tara Duggan’s Root to Stalk Cooking, and try her recipes for radish green salad and chard stem hummus, or this recipe for carrot top pesto from Gloria Polo of East Bay Community Recovery Project. Be a clever chef. Go ahead and eat those strawberry tops and cucumber ends. Don’t worry about cutting out those tomato cores. Laziness in the kitchen means less goes into the compost. Shop wisely and buy only what you need. A little meal planning can go a long way in keeping food waste to a minimum. Shop in bulk for pantry items, and buy produce in smaller quantities more frequently. Cooking perishable items soon after purchase will help you avoid spoilage down the road and provide quick, easily reheated meals for the rest of the week. Store smarter. Don’t let good produce go bad. Many produce items spoil prematurely due to poor storage, so get to know the storage needs of different fruits and vegetables. For example, tomatoes keep best at room temperature, while greens stay freshest placed in a plastic bag with a paper towel in the refrigerator crisper drawer. One rotten apple does indeed spoil the bunch, so compost any damaged items (keeping the still-edible parts) to avoid letting spoilage spread. Here are some additional tips. Know your refrigerator’s microclimates. Did you know that not all refrigerator shelves are created equal? The lowest shelves are the coolest place to store foods with a high safety risk like meats and poultry, while ready-to-eat or pre-cooked items like leftovers can be stored on the slightly warmer upper shelves. 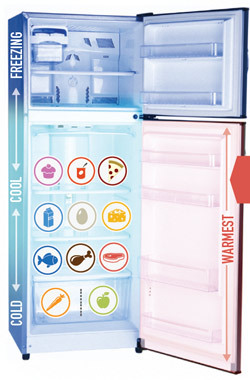 The fridge door is the warmest zone, so it’s best for storing condiments (not dairy or eggs). Watch this video or print out this helpful infographic to stick on your fridge as a reminder. Take “sell by” dates with a grain of salt. A report by the NRDC found that “sell by,” “use by,” and “best by,” which lack uniformity and federal regulation, create confusion and unnecessary food waste in the home. While such dates are set by manufacturers in order to let retailers know when food is at its peak quality, they cause nine out of ten Americans to needlessly dispose of perfectly good food. While expiration dates can be a starting point for gauging freshness, let your eyes, nose, and common sense be your guide. Share the bounty. Got a fruit tree or home garden with an overwhelming bounty? Have safe, edible food that you don’t want to go to waste? Bay Area residents can contact Food Runners for a list of community centers, pantries, and other agencies that accept food donations from the home. When all else fails, compost. If after all these measures you still have food scraps, put them in the compost bin, not the garbage. Food waste rotting in landfills accounts for 25 percent of methane emissions in the US, while composting reduces our climate impact and recycles nutrients to grow more food. Stop by CUESA’s Food Shed at the Ferry Plaza Farmers Market on Saturdays (next to the Info Booth) to learn how you can be part of the solution. Play a culinary matching game, add artistic flair to a gallery of “ugly” fruits and veggies, and try pickled watermelon rind to get inspired to waste less at home.